The Taryn All Weather Wicker Collection's luxurious estate style, comfort and durability will make your patio the talk of the neighborhood. This Wicker Patio Furniture set is made of Viro, all weather wicker, woven over rust-resistant, heavy-duty all welded frames fitted with Sunbrella fabric cushions. 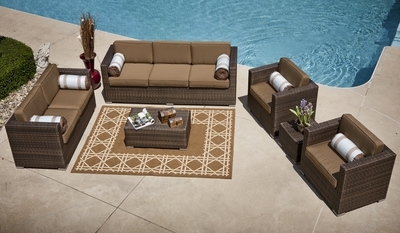 The Taryn All Weather Wicker Patio Furniture Set includes versatile sectional pieces, fully woven coffee table and end table. Cushions shown in Sunbrella Canvas Cocoa fabric and are included with this set. You won't be disappointed. The wicker color of this set is Prussian Dark Bronze.